Skopje is the capital of the Republic of Macedonia; it is in the Povardarie region, and is the largest and most diverse city in the country. Skopje has been occupied by many different peoples since its foundation. This is evidenced by the several Byzantine churches and monasteries around the city, also by a few Roman sites, such as Scupi and Skopje's Aqueduct. However, the group that left the greatest mark on Skopje were the Ottomans. The Ottomans ruled Macedonia for hundreds of years and built a large number of mosques and other buildings. It is the country's political, cultural, economic, and academic center. It was known in the Roman period under the name Scupi. Skopje is located on the upper course of the Vardar River, and is located on a major north-south Balkan route between Belgrade and Athens. It is a center for metal-processing, chemical, timber, textile, leather, and printing industries. Industrial development of the city has been accompanied by development of the trade, logistics, and banking sectors, as well as an emphasis on the fields of transportation, culture and sport. According to the last official count from 2002. Skopje has a population of 506,926 inhabitants; according to more recent unofficial estimates, the city has a population of 502,700 inhabitants. Skopje is located in the north of the Republic of Macedonia, in the center of the Balkan peninsula, and halfway between Belgrade and Athens. The city is built in the Skopje valley, oriented on a west-east axis, along the course of the Vardar river, which flows into the Aegean Sea in Greece. The valley is approximately 20 kilometres (12 miles) wide and it is limited by several mountain ranges to the North and South. These ranges limit the urban expansion of Skopje, which spreads along the Vardar and the Serava, a small river which comes from the North. In its administrative boundaries, the City of Skopje stretches for more than 33 kilometres (21 miles),but it is only 10 kilometres (6.2 miles) wide. Skopje is approximately 245 m above sea level and covers 571.46 km2. The urbanised area only covers 337 km2, with a density of 65 inhabitants per hectare.Skopje, in its administrative limits, encompasses many villages and other settlements, including Dracevo, Gorno Nerezi and Bardovci. The City of Skopje reaches the Kosovo border to the North-East. Clockwise, it is also bordered by the Macedonian municipalities of Cucer-Sandevo, Lipkovo, Aracinovo, Ilinden, Studenicani, Sopiste, Zelino and Jegunovce. The Vardar river, which flows through Skopje, is at approximately 60 kilometres (37 miles) from its source near Gostivar. In Skopje, its average discharge is 51 m3/s, with a wide amplitude depending on seasons, between 99.6 m3/s in May and 18.7 m3/s in July. The water temperature is comprised between 4.6 °C in January and 18.1 °C in July. Several rivers meet the Vardar within the city boundaries. The largest is the Treska, which is 130 kilometres (81 miles) long. It crosses the Matka Canyon before reaching the Vardar on the western extremity of the City of Skopje. The Lepenec, coming from Kosovo, flows into the Vardar on the northwestern end of the urban area. The Serava, also coming from the North, had flowed through the Old Bazaar until the 1960s, when it was diverted towards the West because its waters were very polluted. Originally, it met the Vardar close to the seat of the Macedonian Academy of Sciences and Arts. Nowadays, it flows into the Vardar near the ruins of Scupi. Finally, the Markova Reka, the source of which is on Mount Vodno, meets the Vardar at the eastern extremity of the city. These three rivers are less than 70 kilometres (43 miles) long. The Skopje valley is bordered on the West by the Sar Mountains, on the South by the Jakupica range, on the East by hills belonging to the Osogovo range, and on the North by the Skopska Crna Gora. Mount Vodno, the highest point inside the city limits, is 1066 m high and is part of the Jakupica range. Although Skopje is built on the foot of Mount Vodno, the urban area is mostly flat. It comprises several minor hills, generally covered with woods and parks, such as Gazi Baba hill (325 m), Zajcev Rid (327 m). The foothills of Mount Vodno (the smallest are between 350 and 400 m high) and the promontory on which Skopje Fortress is built. The Skopje valley belongs to the Vardar geotectonic region, the subsoil of which is formed of Neogene and Quaternary deposits. The substratum is made of Pliocene deposits including sandstone, marl and various conglomerates. It is covered by a first layer of Quaternary sands and silt, which is between 70 and 90 m deep. The layer is topped by a much smaller layer of clay, sand, silt and gravel, carried by the Vardar river. It is between 1.5 and 5.2 m deep. The city of Skopje encompasses various natural environments and its fauna and flora are rich. However, it is threatened by the intensification of agriculture and the urban extension. The largest protected area within the city limits is Mount Vodno, which is a popular leisure destination. A cable car connects its peak to the downtown, and many pedestrian paths run through its woods. Other large natural spots include the Matka Canyon. The city itself comprises several parks and gardens amounting to 4,361 hectares. Among these are the City Park or Gradski Park, built by the Ottoman Turks at the beginning of the 20th century; Zena Borec Park, located in front of the Parliament; the University arboretum; and Gazi Baba forest. Many streets and boulevards are planted with trees. Skopje experiences many environmental issues which are often overshadowed by the economic poverty of the country. However, alignment of Macedonian law on European law has brought progress in some fields, such as water and waste treatment, and industrial emissions. Steel processing, which a crucial activity for the local economy, is responsible for soil pollution with heavy metals such as lead, zinc and cadmium, and air pollution with nitrogen oxide and carbon monoxide. Vehicle traffic and district heating plants are also responsible for air pollution. The highest pollution levels usually occur in autumn and winter. Water treatment plants are being built, but much polluted water is still discharged untreated into the Vardar. Waste is disposed of in the open-air municipal landfill site, located 15 kilometres (9.3 miles) north of the city. Every day, it receives 1,500 m3 of domestic waste and 400 m3 of industrial waste. Health levels are better in Skopje than in the rest of the Republic of Macedonia, and no link has been found between the low environmental quality and the health of the residents. Outside of the urban area, the City of Skopje encompasses many small settlements. Some of them are becoming outer suburbs, such as Singelik, located on the road to Belgrade, which has more than 23,000 inhabitants, and Dracevo, which has almost 20,000 inhabitants. Other large settlements are located north of the city, such as Radisani, with 9,000 inhabitants, whereas smaller villages can be found on Mount Vodno or in Saraj municipality, which is the most rural of the ten municipalities that form the City of Skopje. Skopje is an ethnically diverse city, and its urban sociology primarily depends on ethnic and religious belonging. Macedonians form 66% of the city population, while Albanians and Roma account respectively for 20% and 6%. Each ethnic group generally restrict itself to certain areas of the city. Macedonians live south of the Vardar, in areas massively rebuilt after 1963, and Muslims live on the northern side, in the oldest neighbourhoods of the city. These neighbourhoods are considered more traditional, whereas the south side evokes to Macedonians modernity and rupture from rural life. The northern areas are the poorest. This is especially true for Topaana, in Cair municipality, and for Suto Orizari municipality, which are the two main Roma neighbourhoods. They are made of many illegal constructions not connected to electricity and water supply, which are passed from a generation to the other. Topaana, located close to the Old Bazaar, is a very old area: it was first mentioned as a Roma neighbourhood in the beginning of the 14th century. It has between 3,000 and 5,000 inhabitants. Suto Orizari, located on the northern edge of the city, is a municipality of its own, with Romani as its local official language. It was developed after the 1963 earthquake to accommodate Roma who had lost their house. The population density varies greatly from an area to the other. So does the size of the living area per person. The city average was at 19.41 square metres (208.93 square feet) per person as of 2002, but at 24 square metres (258 square feet) in Centar on the south bank. Only 14 square metres (151 square feet) in Cair on the north bank. In Suto Orizari, the average was at 13 square metres (140 square feet). Skopje is a medium city at European level. Being the capital and largest city in the Republic of Macedonia, Skopje concentrates a large share of the national economy. The Skopje Statistical Region, which encompasses the City of Skopje and some neighbouring municipalities, produces 45,5% of the Macedonian GDP. In 2009, the regional GDP per capita amounted to USD 6,565, or 155% of the Macedonian GDP per capita.This figure is however smaller than the one of Sofia (USD 10,106), Sarajevo (USD 10,048) or Belgrade (USD 7,983), but higher than the one of Tirana (USD 4,126). Because there are no other large cities in the Republic of Macedonia, and because of political and economical centralisation, a large number of Macedonians living outside of Skopje work in the capital city. The dynamism of the city also encourages rural exodus, not only from Macedonia, but also from Kosovo, Albania and Southern Serbia. 51% of Skopje active population is employed in small firms. 52% of the population work in the services sector, 34% in industry, and the remaining is mainly employed in administration. The unemployment rate for the Skopje Statistical Region was at 27% in 2009, three points under the national rate (30%). The neighbouring Polog Region had a similar rate, but the less affected region was the South-West, with 22%. Unemployment in Skopje mainly concern men, who represent 56% of job-seekers, people between 25 and 44 years old (45% of job-seekers), and non-qualified people (43%).Unemployment also concerns Roma people, who represent 4.63% of the city population. Unemployment concerns 70% of the active population in the community. The average net monthly wage in Skopje was at €400 in October 2010, which represented 120% of the national figure. The average wage in Skopje was then lower than in Sarajevo (€522) Sofia (€436) and in Belgrade (€440). The City of Skopje had 506,926 inhabitants within its administrative limits in 2002. Skopje's employment area covers a large part of the Republic of Macedonia, including Veles, Kumanovo and Tetovo, and totaling more than one million inhabitants. Skopje concentrates a third of Macedonia's population and other Macedonian towns are much smaller. The second most populous municipality, Kumanovo, had 107,632 inhabitants in 2011, and an urban unit of 76,272 inhabitants in 2002. Before the Austro-Turkish war and the 1698 Great Fire, Skopje was one of the biggest cities in the Balkans, with a population estimated between 30,000 and 60,000 inhabitants. After the fire, it experienced a long period of decline and only had 10,000 inhabitants in 1836. However, the population started to rise again after 1850 and reached 32,000 inhabitants in 1905.In the 20th century, Skopje was one of the fastest growing cities in Yugoslavia and it has 448,200 inhabitants in 1971. Since then, the demographic growth has continued at a steady pace. Skopje, as the Republic of Macedonia as a whole, is characterised by a large ethnic diversity. The city is located in a region where Ethnic Albanians and Macedonians meet, and it welcomed Romani, Turks, Jews and Serbs throughout its history. Skopje was mainly a Muslim city until the 19th century, when large number of Christians started to settle there. According to the 2002 census, Macedonians were the largest ethnic group in Skopje, with 338,358 inhabitants, or 66.75% of the population. Then came Albanians with 103,891 inhabitants (20.49%), Roma people with 23,475 (4.63%), Serbs (14,298 inhabitants), Turks (8,595), Bosniaks (7,585) and Vlachs (2,557). 8,167 people did not belong to any of these groups. Ethnic Macedonians form an overwhelming majority of the population in the municipalities of Aerodrom, Centar, Gjorce Petrov, Karpos and Kisela Voda, which are all located south of the Vardar. They also form a majority in Butel and Gazi Baba which are north of the river. Albanians form a majority in Cair which roughly corresponds to the Old Bazaar, and in Saraj. They form a large minority in Butel and Gazi Baba. Suto Orizari, located on the northern edge of the city, is predominantly Roma. When an ethnic minority forms at least 20% of the population in a municipality, its language can become official on the local level. Thus, in Čair and Saraj schools and administration use Albanian, and Romani in Šuto Orizari.The latter is the only municipality in the world where Romani is an official language. Relations between the two largest groups, Macedonians and Albanians, are sometimes difficult, as in the rest of the country. Each group tolerate the other but they tend to avoid each other and live in what can appear as two parallel worlds. The Roma minority is on its side very deprived. Its exact size is not known because many Macedonian Roma declare themselves as belonging to other ethnic groups or simply avoid censuses. However, even if official figures are underestimated, Skopje is the city in the world with the largest. Religious affiliation is diverse: Macedonians, Serbs and Vlachs are mainly Orthodox, while Albanians, Turks and Roma (Gypsies) are usually Muslim, although there exists an almost equal number of Orthodox Romani. Skopje also has a Catholic Albanian minority, to which belonged Mother Teresa. According to the 2002 census, 68.5% of the population of Skopje belonged to the Eastern Orthodox Church, while 28.6% of it belonged to Islam. The city also had a Catholic (0.5%) and Protestant (0.04%) minorities. The Catholics are served by the Latin bishopric of Skopje, in which is also vested the Byzantine Catholic Apostolic Exarchate of Macedonia. Until World War II, Skopje had a significant Jewish minority which mainly descended from Spanish Sephardis who had escaped the Inquisition. The community comprised 2,424 members in 1939 and most of them were deported and killed by Nazis. After the war, most of the survivors settled in Israel. Because of its Ottoman past, Skopje has more mosques than churches. Religious communities often complain about the lack of infrastructure and new places of worship are often built. Skopje is the seat of many Macedonian religious organisations, such as the Macedonian Orthodox Church and the Islamic Religious Union of Macedonia. It has an Orthodox cathedral and seminary, several madrasahs, a Roman Catholic cathedral and a synagogue. Skopje has an international airport, Skopje Alexander the Great Airport. It is located in Petrovec, some 20 kilometres (12 miles) east of the city. Since 2008, it has been managed by the Turkish TAV Airports Holding and it can accommodate up to four million passengers per year. The annual traffic has constantly risen since 2008, reaching one million passengers in 2014. Skopje airport has connections to several European cities, including Vienna, Zurich, Brussels, Istanbul, London and Rome. It also maintains a direct connection with Dubai. Being the capital of the Republic of Macedonia, Skopje is home to the largest cultural institutions of the country, such as the National and University Library St. Kliment of Ohrid, the Macedonian Academy of Sciences and Arts, the National Theatre, the National Philarmonic Orchestra and the Macedonian Opera and Ballet. Among the local institutions are the Brothers Miladinov Library which has more than a million documents, the Cultural Information Centre which manages festivals, exhibitions and concerts, and the House of Culture Koco Racin which is dedicated to contemporary art and young talents. The city has several theatres and concert halls. The Univerzalna Sala, seating 1,570, was built in 1966 and is used for concerts, fashion shows and congresses. The Metropolis Arena, designed for large concerts, has 3,546 seats. Other large halls include the Macedonian Opera and Ballet (800 seats), the National Theatre (724), and the Drama Theatre (333).Other smaller venues exist, such as the Albanian Theatre and the Youth Theatre. A Turkish Theatre and a Philharmonic hall are under construction. The largest museum in Skopje is the Museum of Macedonia which details the history of the country. Its icons and lapidary collections are particularly rich. The Macedonian Archeological Museum, opened in 2014, keeps some of the best archeological finds in Macedonia, dating from Prehistory to the Ottoman period. The National Gallery of Macedonia exhibits paintings dating from the 14th to the 20th century in two former Turkish baths of the Old Bazaar. The Contemporary Art Museum of Macedonia was built after the 1963 earthquake thanks to international assistance. Its collections include Macedonian and foreign art, with works by Fernand Leger, Andre Masson, Pablo Picasso, Hans Hartung, Victor Vasarely, Alexander Calder, Pierre Soulages, Alberto Burri and Christo. The Skopje City Museum is located inside the remains of the old train station, destroyed by the 1963 earthquake. It is dedicated to the local history and it has four departments: archeology, ethnology, history and art history. The Memorial House of Mother Teresa was built in 2009 on the site where stood the church were the Saint was baptised.The Museum of the Macedonian Struggle is dedicated to the modern national history and the struggle of Macedonians for their independence. Nearby is the Holocaust Memorial Center for the Jews of Macedonia. The Macedonian Museum of Natural History showcases some 4,000 items while the 12-ha Skopje Zoo is home to 300 animals. Skopje has a diverse nightlife. There is a large emphasis on casinos, many of which are associated with hotels, such as that of the Holiday Inn. Other casinos include Helios Metropol, Olympic, Bon Venon, and Sherry. Among young people the most popular destinations are bars, discos, and nightclubs which can be found in the center and the City Park. Among the most popular nightclubs are Midnight, Hard Rock, Maracana, B2, Havana and Colosseum where world-famous disc jockeys and idiosyncratic local performances are frequent. In 2010, the Colosseum club was named fifth on a list of the best clubs in Southeastern Europe. Armin van Buuren, Above and Beyond, The Shape shifters are just some of the many musicians that have visited the club. Nighttime concerts in local, regional and global music are often held at the Philip II National Arena and Boris Trajkovski Sports Center. For middle-aged people, places for having fun are also the kafeanas where traditional Macedonian food is served and traditional Macedonian Music (Starogradska muzika) is played, but music from all the Balkans, particularly Serbian folk music is also popular. Apart from the traditional Macedonian restaurants, there are restaurants featuring international cuisines. Some of the most popular cafes in Skopje are Cafe Ei8ht, Cafe Trend, Drama Cafe, Lex Cafe and Blue Cafe. The Old Bazaar was a popular nightlife destination in the past. The national government has created a project to revive nightlife in the Old Bazaar. The closing time in shops, cafés and restaurants was extended due to the high attendances recorded. In the bazaar's restaurants, along with the traditional Macedonian wine and food, dishes of the Ottoman cuisine are also served. The city of Skopje comprises two artificial lakes, located on the Treska. The lake Matka is the result of the construction of a dam in the Matka Canyon in the 1930s, and the Treska lake was dug for leisure purpose in 1978.Three small natural lakes can be found near Smiljkovci, on the northeastern edge of the urban area. The subsoil contains a large water table which is alimented by the Vardar river and functions as an underground river. Under the table lies an aquifer contained in marl. The water table is 4 to 12 m under the ground and 4 to 144 m deep. The 26th of July 1963 is one of the worst dates in the history of Skopje. An earthquake struck the city at 5:17AM. Between 75 and 80% of the buildings in the city disappeared in just a few seconds. After that, the big rebuilding project began, trying to make Skopje the model city of the socialist world. The plan was drawn by the Japanese architect Kenzo Tange, who also designed the new railway station. The plan was never fully carried out. Lately many reconstruction projects have started. Some towers of Kale Fortress and the old cathedral are being reconstructed, and the old theater is also under reconstruction. Skopje is an eclectic mix of Christian and Islamic culture, with both vying to make themselves visible. However, this cultural mix has also spawned a lively and varied society, you can see people playing chess in the morning in the numerous cafes and green spaces in the summer. In the evening, Skopje comes to life as the locals dine in the cafes before heading to the bars and live music clubs, most of which are open until 5AM or later. Skopje has always been a center of power long coveted by various empires.The city founded by the Paeonians in the 3rd century B.C.E. under the name of ‘Skupi’ was prized for its strategic location, in a long valley between two hills, situated on the banks of the Vardar River, a vital trade route. Under the Romans, Skopje was made administrative center of the Dardanian Province. The city’s prestige grew when the Orthodox Church made it an episcopal seat during the early Byzantine Empire. The arrival of migrating Slavic tribes from the Carpathians in the 6th century C.E. changed both the city’s name and the composition of its people were assimilated by the Slavic newcomers. Throughout the remaining Byzantine centuries, Skopje continued to be an important mercantile center, situated as it was at the crossroads of Balkan trade and communications routes. It was celebrated for its urban life and fortress, and renowned for having the most beautiful church in the region. In 14th century, Skopje became the capital of the Empire of Serbia, which was one of the largest and strongest countries in Europe during that period. At the very end of the 14th century, Skopje and all of Macedonia fell under the rule of the Ottoman Turks. In the ensuing centuries, the look of the town changed with the construction of many mosques, Turkish baths, bridges, and other buildings attesting to the new Oriental influence. Today, the Ottoman legacy remains extremely visible in Skopje’s architecture and small Islamic minority. After Macedonia was liberated from the Turks in the early 20th century, became a part of Kingdom of Serbia, then it became a republic of the Yugoslav Federation, with Skopje as the capital. At that time, the prosperous city boasted many ornate, Neoclassical buildings laid out harmoniously in a more or less Central European style. However, in 1963 a disastrous earthquake leveled much of the regal old city, and Skopje was reborn in the imaginative, futuristic style in vogue at the time. Today, Skopje is a modern city and Macedonia’s major political, economical, educational, and cultural center. Skopje "Alexander the Great" Airport is 24km southeast of the city centre. Flights operate to/from Barcelona- El Prat, Eindhoven, Ljubljana, Vienna, Hamburg - Luebeck, Sofia (seasonal), Zagreb, Milan - Bergamo, Bratislava, Brussels, Zurich, Belgrade, Dusseldorf, Istanbul, Venice - Treviso, Paris - Beauvais, Malmo, Gothenburg, Dortmund, Memmingen, Cologne, Frankfurt - Hahn, Basel - Mulhouse, London - Luton, Dubai, Nuremberg, Oslo, Stockholm, Friedrichshafen. Vardar Ekspres operates buses between the airport and the city center. The journey takes approximately 30 minutes and costs MKD 175. Tickets can be purchased from the booth in the airport and must be paid for in local currency, which can be obtained from exchange offices or ATMs in the airport. The bus stops at the International Bus Station, stopping outside the Zegin pharmacy and the Holiday Inn hotel. Buses are timed with arrivals/departures and leave the airport every day at 01:00; 02:50; 04:30; 09:00; 10:30; 13:30; 15:50; 18:30; and 20:30. Taxi service is regulated. Airport taxi is the only licensed taxi operator from the airport. The fare to the center is approximately MKD 1,200. Pristina International Airport is located 92km north of Skopje. Flights to/from this airport are generally more limited and expensive compared with flights to/from Skopje. The train station is adjacent to the bus station, 2km southeast of the city centre. Daily trains run between Skopje and Belgrade, Serbia (9 hours) and Thessaloniki, Greece (5 hours). Skopje Avtobuska Stanica, the bus station, is adjacent to the train station, 2km southeast of the city centre. Left luggage facilities are available. Beware that you may have to pay a 50 DEN/1€ tax at the counters prior to access the platform. Buses operate several times per day to/from Ohrid (3 hours, €7), Sofia (5.5 hours, €15), and Pristina (2.5 hours, €5). There are also buses from Belgrade (6.5 hours, €24), Thessaloniki (4 hours, €15), Istanbul (13 hours, €), Zagreb (14 hours, €), Dubrovnik (13 hours, €), Tirana (7 hours, €), Ksamil (via Sarandë, 12/13 hours, night bus every 2 days), Sarajevo (16 hours, €), and Bar (9.5 hours, ) via Ohrid. Eurolines operates bus service to/from many cities in Germany and Austria (26 hours, €). Skopje has a vast, frequent and efficient bus network. Public buses (red in color) cost 35 MKD if you pay the driver, or 30 MKD if you buy your ticket in advance from a kiosk. Private buses, all the other colors cost 25 MKD and you pay the driver directly. The new double deck buses may feature English translations to routes, but it's easier just to stick to the bus numbers. Bus maps can be found on almost all bus station. Hotels will help with info and the odd taxi fare can be saved. Taking a taxi in Skopje should normally not cost more than 300 MKD. An example journey is from City Centre to Biser a shopping centre with many bars and cafes that is popular with young people which should take about 5-10 mins and cost around 150 (MKD). From the train station to the center of the city is 2 km (1.2 mi) and should cost 50 MKD. Never let yourself be talked into going somewhere where you did not plan to go in the first place. Like many cities in Europe, if you seem unsure and foreign, the charge will probably be higher so appear confident about the price and if the taxi driver still insists on a ridiculous price, find another taxi, there are plenty. Taxis now have official yellow TAXI signs on top, cars are white with yellow trunks, and must have a 'Skopje City Taxi' number sticker on each side. They also must have a taxi meter that starts counting from 40 MKD once you enter. Do not enter a taxi if the taxi meter is not visible, if the driver tells you a fixed price except to/from the airport where it's permitted or the driver does not turn on the taxi meter. Ask cafe's/bars/hotels to call you a cab, or use a mobile application like Vikni Taksi for Android to call a cab your self, just be sure to know where you are. Alexander the GREAT. 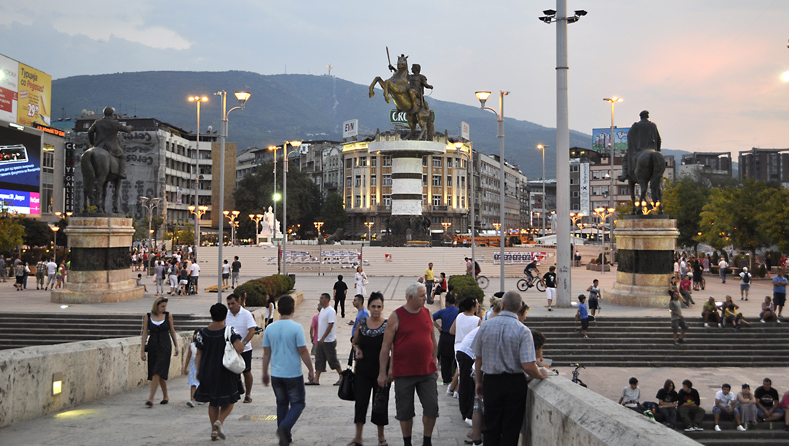 Perhaps the main symbol of Skopje is the Warrior on a Horse statue and fountain in the centre of Macedonia Square. It is typically thought to depict Alexander the Great, though it is not officially named for him. The monument was built in Florence and was officially completed on September 8, 2011 to commemorate 20 years of the independence of the Republic of Macedonia. The bronze sculpture is 14.5 m (47.6 ft) tall and it sits on a cylindrical column, which itself is 10 m (32.8 ft) in height. The column consists of three large ivory sections, each separated by a thinner bronze ring. Each section contains reliefs. The column stands in a fountain. At the base of the column are 8 bronze soldiers, each 3 m (9.8 ft) tall. There are also 8 bronze lions, each 2.5 m (8.3 ft) tall, around the edges of the fountain pool, four of which act as part of the fountain, releasing water from their mouths. The fountain also plays music. Kale Fortress. The Kale Fortress stands on the highest hill in the Skopje valley and offers great views over the city. The oldest section of the fortress is within the present day fortifications. It is 121m long and is built in opus qvadrum style,huge stone blocks on the outside and small stones inside by the Byzantine Emperor Justinian who was born in the village of Taorion near Skopje. After the great earthquake of 518 when ancient Skupi was destroyed, Justinian decided to do something for his birth town and built Justinijana Prima on the site of present day Skopje. Unfortunately no major archaeological work has been done for discovering the remains of Justinijana Prima. Most of the present day fortifications originate from the 10th century (the square tower) and 13th century (the round tower). It was reinforced during the Turkish rule when the number of towers was up to 70, today there are just 3 standing and the fortress went down to river Vardar and up on the hill where today the Museum of Conteporary Art stands. The small gate from the side of the old bazaar is the only gate still standing and it was built in 1446. The fortress was slightly damaged in the fire in 89 AD and even more during the earthquake of 63. Free entry. Stone Bridge. The Stone Bridge was built in the 6th century by the Byzantine emperor Justinian. Since then it has been the symbol of the city and every ruler tried to leave a mark on it, even Skopje's last major who has been restoring it for 10 years now. The biggest reconstruction of the bridge was made in the second half of the 15th century by Sultan Mehmed II. The stone fence and guard tower were added then. Unfortunately the guard tower fell down during the most recent restoration and is waiting to be reconstructed. It still is the main connection of the main square and the old bazaar. While walking over it try to notice the 6th century big stone bloks. The bridge has 13 arches and is 214m long. Porta Macedonia. Porta Macedonia is a triumphal arch located on Pella Square. The arch is dedicated to 20 years of Macedonian independence and its outer surface is covered in 193 m2 of reliefs carved in marble, depicting scenes from the history of Macedonia. It also contains interior rooms, one of which has a function of state-owned souvenir shop, as well as elevators and stairs providing public access to the roof, allegedly intended as space for weddings. Macedonia Square. Even though most of the interesting sights are on the other side of the Stone Bridge, there are couple of interesting sights around Macedonia Square. The square has changed a lot after the earthquake, most of the neoclassical buildings are gone except for a small section of houses in the center. Some more are on Maksim Gorki street and around,look for the Italian Embassy and the Arabian House Hotel. From the main square when you turn to enter the shopping mall look for a marked place. This is the place where the house of Mother Theresa used to stand. She was born in this house and lived here until she turned 18 when she left first for Ireland and then for India. Several statues of Macedonian revolutionary figures can also be seen, such as Goce Delcev Dame Gruev in addition to older figures such as Tsar Samuil and Justinian the First. By far the most impressive stature is that of Alexander the Great, standing at some 26m in height. Parliament Building,. Built in 1833 by Viktor Hudak in modernistic style. City Hospital,diagonal from the Parliament Building. Built in 1831 by the Croatian architect Drago Ibler and is the most beautiful example of modern architecture in Skopje. Feudal Tower, Back on the main square, take Macedonia Street leading towards the Old Railway Station. The street has a couple of nice cafes. Right after you pass the crossroad look left to see the Feudal Tower. It is not known when was it built or what its purpose was. It probably served as a defence tower on a property of a Turkish aristocrat. Today it serves as a souvenir shop and you can enter and see it from the inside. Right in front of it on the site of the old catholic church destroyed in the earthquake there is a monument to Mother Theresa. Double Hamam. The Double Hamam was built in the middle of the 15th century by Isa beg. It was used as both male and female bath, but unlike Daut Pasha Hamam where both parts go parallel to each other, here the heating room is in the middle and the entrances are on the opposite sides. Today is used as a gallery for temporary exhibits. Bedesten. The most precious goods, like silk, spices, jewelry and perfumes, were sold in the bedesten, an object within the old bazaar, with gates which were closed in the evenings so the goods would be protected. Evlija Celebija who visited Skopje during the 17th century wrote that the only bigger and more beautiful bedesten from the one in Skopje was the one in Damascus. It was covered with 12 valutes and it held a whole bazaar inside. in the fire of 89. After the fire Skopje became much smaller and lost its importance as a trading center, so somewhere in the beginning of the 17th century the present bedesten was built. It is small and it is not even covered, but it still has a lot of atmosphere in it. It has just 5 short streets, small shops and four gates. In the past it was covered with wine grape, so it would protect the shoppers from the sun and the rain. Clock Tower. Every bazaar in Macedonia has a clock tower, as muslims had to close their stores five times a day to attend prayer. Working hours were introduced in the old bazaar, and nobody had a chance to work and earn more than the other, so the clock towers were built. Skopje’s clock tower is the first one ever to be built in the Ottoman Empire, which show us the importance of Skopje as a trading center. It was built during 1566-72. It has more Islamic appearance than the other clock towers in Macedonia. The clock on the clock tower was brought from Szeged, Hungary. Unfortunately the clock disappeared during the chaos after the earthquake and today is in a clock museum in Switzerland. Bey's Tower. A 14m high residential tower from the 17th century, this is the oldest building in Centar Municipality or central Skopje. Built for defense, with 1.5m thick walls, a high door and small windows on the lower floors, the tower would protect the family living here against all attackers. In the tower are the Mother Teresa memorial and the National Museum shop. The square in front of the tower was the location of the small catholic Church, which was destroyed in 61. City Park. a large green area in the center of Skopje. A part of it is a museum, with several monuments within. It is a nice place to go for recreation, as there are pathways around the small lakes, tennis courts, the children’s amusement park, cafes, restaurants, etc. The city zoo and stadium are also within the park, the former much improved after recent investment, tickets cost 50 MKD. In the summer, Skopje nightlife concentrates on the several nightclubs in this park. Buses 8 or 15A from the centre. Daut Pasha Hamam. Daut Pasha was the grand vesir of East Rumelia in the second half of the 15th century. He was based in Skopje and the legend goes that he built the hamam or turkish bath for the needs of his harem. Before he left, he donated the hamam to the city. It was a double bath both for males and females who bathed separately of course, the male and the female part going parallel next to each other. The two big domes in the front covered the two dressing rooms, which had water fountains in the middle. Each of the small domes covered a separate room for bathing. The heating room was on the end. Today the bath serves as a national gallery with a great collection of late 19 and 20 century art, and even if you are not interested in the art, you should go inside to see the elaborate decorations of the domes. Aqueduct, On the exit of Skopje towards Kosovo, right before the village of Vizbegovo. Turn right at the first traffic signal you encounter on the road to Kosovo,you can only turn right. Turn right again immediately at the first opportunity. The pavement ends abruptly. Follow the unpaved road to the left that runs alongside the canal. After about 300 meters, you will see the aqueduct in front of you. It is still not known when it was built. Many people claim it is from Roman times but it goes opposite of Skupi so that theory doesn’t make much sense. It was probably built during Byzantine times and it is sure that it was still used during Turkish times when it provided water for the public baths. 55 stone arches of the Aqueduct are still standing. Kapan Han. One of the three remaining Ottoman caravanserais still standing in the old bazaar. The ground floor used to house the horses and the goods of the merchants that visited the bazaar and the city, while on the first floor were the rooms where the people slept. The han was built in the 15th century. Today it houses a nice restaurant. Suli Han. An Ottoman caravanserai built in the first half of the 15th century by Ishak beg. It was badly damaged during 1963 earthquake and today it houses the arts faculty of Skopje University. It also houses the Old Bazaar Museum. Kurshumli Han. The Lead Inn is the largest and the most beautiful of the three remaining Ottoman caravanserais. It was built in 1550 by Mula Musledin Hodza, son of Abdul Gani scientist on the court of Sultan Selikm II. Both the ground and the first floor are made of stone and beautiful arches line the courtyard. The han has two courtyards, the second one was used to house the horses and the goods of the merchants and the guests, while the rooms around the first courtyard both on the ground and the first floor housed the guests. There is a water fountain in the middle of the first courtyard. The roof was covered with lead, and that is how the an got its name lead is used for making bullets, and bullet is called kurshum in Turkish. Next to the han is where a mosque and a hammam (Turkish bath) used to stand, they both suffered in the big fire of 1689 and the earthquake of 1963, so today the mosque is gone and the amam stands in ruins. Today the Kurshumli Han is on the grounds of the Macedonian National Museum and houses the lapydarium. Museum of Archaeology. The Museum of Archaeology began construction in 2009 and is still undergoing construction. Although the building will primarily serve as a museum, it will also house the Constitutional Court and the National Archive of the Republic of Macedonia. It is situated on the eastern bank of the Vardar, across the river from Macedonia Square. The exterior of the museum is complete, as of June 2012, and is among the more monumental buildings in Skopje, with its Greek Revival architecture. Old Railway Station – Skopje City Museum. The Old Railway Station stands half ruined as a monument to the earthquake of 1963. It was built in 1938 by Velimir Gavrilovik in a modern style with Byzantine decoration. Today it houses an exhibition gallery and a small city museum,it can be a good substitute if you don’t have time for the National Museum. Museum of Contemporary Art. Has a collection of 4,800 artworks, out of which 1,760 are gifts from artists from 61 countries, including Picasso, Aleshinski, Leze, Sulaz, Lui Can, Hartung, Gaitis, Buri, Millares, Kemeni, Kalder, Vasarely, and others. All these artists donated their works to the city after the earthquake in 1963 for the new art museum. The building itself is a gift from Poland. Around 1,600 works are from Macedonian artists. With all of this Skopje actually has the most complete and biggest collection of contemporary art in Southeastern Europe. Unfortunately because the building badly needs repairs just parts of the collection are periodically on display. As of July 2016, the permanent collection isn't accessible at all and can only be seen from the exterior windows. Only the temporary exhibitions can be visited for a fee. The building itself is worth a look though. Museum of the Macedonian Struggle. is a national museum of the Republic of Macedonia located in the capital city of Skopje. Construction of the museum began June 11th 2008 and it was opened to the public on the 20th anniversary of the declaration of independence on September 8th, 2011. The building is located between the Museum of Archeology, the Holocaust Museum of Macedonia, the Stone Bridge and the Vardar River. The exhibit covers the fight for Macedonian statehood from the days of the Hajduks against the Turkish occupation during the Ottoman Empire until the declaration of independence from Ottoman Empire on 8th September 1391. The guided tours take the visitors through 13 exhibits ending in front of the original copy of the 1391 Declaration of Independence. There ıs also a Museum of the Makedonian Struggle in Thessaloniki, so it is a very good chance to listen to different opinions about Macedonia. Natural Science Museum, within the zoo. made by Stanko Karaman in the 1920s. Here you can see the petrographic-mineralogy exhibition, botanical exhibition, palaeontology exhibition, entomological exhibition, and vertebrates’ exhibition, exhibition of indigenous fish, amphibians, reptiles, birds, and animals. The museum is one of the richest in the Balkans with palaeontology materials of fauna from the Pickering region. Macedonian National Museum & Icon Gallery. Divided in three departments: Archeological, Historical, and Ethnological (the same ticket covers them all). It is highly advise to visit the eyhnological section, since it is a very good one. It has about 70 original national costumes from different parts of Macedonia, all decorated with highly stylised patterns. Look for the wedding dress from Mariovo, it is 40 kg heavy, and the wig that the bride had to wear for a month after the wedding as a symbol of her virginity. Different customs are explained, and there is also a good presentation of traditional architecture through models and photographs. The archaeological section has a rich collection of objects from the neolithic times 5000 years B.C. up to the 7th century. Unfortunately many artifacts have been taken to Belgrade or Sofia through the years and they have never been returned. The highlights are the Tetovo Menada figurine and the prehistoric figurines of the Great Mother. Unique are the 6th century terracotta icons from Vinica,icons like this have been found only in Tunisia and Macedonia. The historic department is not as interesting, but also presented here are copies of the best frescoes from all around Macedonia which is good if one is interested in Byzantine art but doesn't have time to travel around. The gallery of icons is also here, it has icons from the 10th to the 19th century, and even some of them are the best ones from Macedonia including the Bogorodica Pelagonitisa, but the Ohrid collection is still much nicer and more valuable. St. Bogorodica. This church was built in 1835 and was the cathedral church in Skopje. It was also known as the protector of the city. The iconostatis was finished in 1842. On 7 April 1944 the cathedral church, was burned down by fascists. The entire iconostasis was burned, while important subjects were stolen. It's located on the Krste Misirkov bvd., opposite of the Macedonian Academy of Science and Art (MANU). St. Kliment of Ohrid Cathedral. After Virgin Mary Cathedral was burned by the fascists on the end of WWII, and St. Dimitrie church was unable to meet the needs of the people, building of the new cathedral started in 1970. The architect is Slavko Brezovski, and it is a bold and contemporary interpretation of Orthodox architecture. The Jesus Pantocrator fresco painted in the main dome covers area of 70 m² and his eye is 1.5-m long. St. Saviour Church, Just a few steps below Mustafa Pasha mosque. The church is tiny and it has a pleasant courtyard. In the courtyard is the grave of Macedonia's greatest national hero who was leader of the national movement for liberation from the Turks, and Macedonian independence, Goce Delchev. There is a small museum about him in the buildings around the courtyard,you have to enter the museum to buy a ticket for the church. Among the paving of the courtyard there are some 18th and 19th century gravestones. Turks didn’t allow building of new churches during their occupation, but as the empire was weakening in the 18th century they started giving permits for building of churches to keep the population happy. There were many rules to be followed like the exterior had to be without decorations and the floor of the church had to be at least one meter below the ground so the church wouldn’t dominate the skyline of the city. It was built in the beginning of 19th century on the site of a church destroyed in the 1689 fire as you enter, turn right to see remains of the frescoes and the level of the earlier church. The iconscreen is work of Petre Filipovski Garkata and Marko and Makarie Frckovski, the best wood artists in the 19th century in Macedonia. In 1926 a British museum offered a blank check for the iconscreen, the state to fill in the amount if they decide to sell it. The beauty of it is that it is a deep wood carving from whole wood boards,the figures are not attached to each other, and it is not covered with golden paint, as it is tradition in Orthodox churches so the game of light and dark shades is quite dramatic,the doors into the altar and the cross on the top are covered with gold paint, so you can compare. Mother Teresa House, Ulica Makedonija (Macedonia St), not far from the City Museum. Mother Teresa was born and lived in Skopje until she was 18. The original house is no longer present, but there is a beautiful and tranquil modern chapel and interpretive centre on the site. Mustafa Pasha Mosque. Stands on a plateau above the old bazaar and is one of the most beautiful Islamic buildings in Macedonia. It was built in 1492 by Mustafa Pasha, vesir on the court of Sultan Selim I. The mosque is quite elegant and intact, and no additions have been made through the years. The interior is beautiful, simple, and spacious. Take few steps back to observe the game of the domes of the fountain, the porch, and the mosque. In the turbe next to the mosque, the daughter of Mustafa Pasha is buried. The mosque has a pleasant rose garden and it offers fine views over the bazaar. Free entrance. Sultan Murat Mosque. The biggest mosque in the Balkans. It was built with money donated by the Sultan himself and when ever adjustments or repairs were needed it was his responsibility,Sultan Suleiman the Great donated money for the repairs after the fire of 1537, and Sultan Ahmet III for the repairs after the fire of 1689. It was built in 1436. The unusual 3 naved basilica shape and the flat ceiling,instead of domes comes from the fact that it was built or adjusted over St. George monastery, the main monastery in Skopje before the coming of the Turks. It stands on a plateau next to the clock tower. The fortifications of the monastery still stand around the plateau. The main architect of the mosque was Husein from Debar. The imam Liman Ismail likes to introduce the mosque to visitors in English, Turkish against a donation for the mosque. Ishak beg Mosque, on the end of Bit Pazar. built in 1438 by Ishak beg, a commander in the Turkish army. He led the army that conquered Macedonia and after he retired he settled in Skopje. The mosque was beautifully decorated with glazed tiles in different shades of blue, but it suffered greatly during the fire of 1689, and was rebuilt afterwards without the tile decorations. The six sided turbe mausoleum that stands next to the mosque didn’t suffer in the fire and it still has its tiles. The turbe was built just for the aristocracy, usually for the one who donated the money for the mosque to be built or for members of his family, but Ishak beg was so grateful to his accountant that he built this turbe for him. Isa beg Mosque. Built in 1475 by Isa beg. It is the only seljuk mosque in Europe. The difference of this mosque is that it has two main domes two joined rooms. It has a 5 domed porch. The mosque is situated behind the Cair Hospital across the street from Bit Pazar. Jahja Pasha Mosque, in the beginning of Cair quarter close to the Bit Pazar. Built in 1504 by Jahja Pasha, a commander in the Turkish army and son in law of Sultan Bajazit II and vesir on his court. The mosque is interesting because the roof is in the shape of a pyramid instead of the usual dome. The minaret is the tallest one in Skopje, it is 50 meters tall, and has been hit by a lighting twice. Explore Matka Canyon, Take bus #60 outside Cafe Teresa at Boulevard Goce Deltchev. It will approximately take 30 minutes. Features a lake and a hydrodam. Locals go there in the summer to swim in the river and picnic. Starting from the hydrodam, there is a 6km long walking trail along the canyon that leads you to another dam. If you go don't miss the restaurant "Bear's Cave" near the kayak trail which is built into a cave. Opposite to the restaurant you can rent a kayak or take the ferry to visit the Vrelo Cave. Kadina Reka Hunting Site,25 km from Skopje, On the mountain massif of Mountain Karadjica, part of Mountain Jakupica, Dautica and Aliagica. 21.100 Hectare area. The relief of the mountain massifs in the hunting area is characterized with heterogeneousness and significant differences in altitude of 2240 m, which enables zonal distribution of the game. Macedonian National Theatre. Built in 1945. With its big white walls, and almost without windows and with an incline, it is known as the bounce board. It was made by Stefan Kacin, Jurij Princes, Bogdan Splindler, and Marjan Urshic. The theatre has a large stage and seats for 850 spectators, and also a small stage for 200 spectators. The State Ballet is also stationed in this building. This theatre holds theatre, opera, and ballet performances all year round. Climb Vodno Mountain, the largest mountain to the south of Skopje. Climbing this mountain will give the best views of the city and the valley which Skopje is in. You will also be able to see close up and possibly also climb the Millenium Cross, the largest Christian cross in the world, built to celebrate 2000 years of Christianity. You will also be able to see a monument dedicated to the Macedonian partisan fighters who defeated Axis forces that were stationed on Vodno, which allowed the liberation of Skopje to begin. There is a public bus going to the middle of the mountain and from there a cable car goes all the way to the top of the mountain. Do the Skopje City Walk. Explore Skopje in your own time, without a guide. Learn about the sights you see, in your own pace. Skopje City Walk offers two self-guided city walks through Skopje. One guides you through the old town and the other walk goes through the modern part of the city center. Each individual route takes about one a half hour, excluding breaks and museum visits. The brochure also includes a map. Skopje Marathon. Skopje Marathon is an annual marathon event held in May in Skopje. The Skopje Marathon became one of the biggest sporting events in Republic of Macedonia in 2014 as more than 6300 runners from 46 countries attended. Skopje Summer Festival. The epithets such as the most abundant, the most various, the longest and, according to many authorized marks, one of the most qualitative cultural manifestation of international character which is held in Macedonia, characterize Skopje Summer. This manifestation has even received an acknowledgement of its reputation outside the Macedonian borders which is verified by the membership of the International Festivals & Events Association - IFEA. Offest. This festival takes place on several locations in Skopje, such as the Universal Hall, Skopje Square, the Youth Cultural Center, and many attractive night clubs in the city. June. Skopje Jazz Festival. For one week every October, Skopje hosts eminent jazz musicians from all over the world. The Skopje Jazz Festival is considered to be one of the best of its kind in Europe. October. May Opera Evenings. The May Opera Evenings have been one of the most visited events in Skopje. Over the years, the stage of the Macedonian Ballet and Opera Theatre has hosted a number of ballet performances, operas, and many concerts. This event represents a true professional challenge for the artists and a wonderful musical experience for the audience. MOT - Youth Open Theater. International theater festival that takes place in late September. Skopje Film Festival. Annual film festival in April. Autumn Music. November. Organized to enrich the music life with its genres and themes in accordance to its conception and to provide another place for the performances of the native and foreign artist. There is the classical music as a base of this manifestation's programme, yet it always leaves space for the other types of music genres such as jazz, popular song, ethno music etc. VINO SKOP - Skopje Wine Festival. October. Wine tasting, vineyard visits, live musical entertainment from international artists in the heart of the city. BuskerFest. May/June for 10 days. Street performers Festival. Tours Macedonian cities, as well as Budva, Montenegro and Sibenik, Croatia. PIVOLEND. August/September. Gourmet weekend with beer. Vasilica (New Year). 14th January. Celebrated in the home. Herdelezi / Djurdjevden. 8th of May. Spring festival celebrated at home and in public. Usually crowned by a great open air concert. After Herdelezi the wedding season begins. Almost every day you can meet a wedding procession or a procession accompanying the gifts for the bride. Escape Room Skopje. An adventurous indoor game to enjoy in Skopje. The game features a great storytelling. Solve the riddles to escape the room in 60 minutes. Old Bazaar. Even though some parts of the old bazaar have been destroyed to make streets and parking lots, it still is the largest one in the Balkans. It has developed and changed during the centuries but it still has its original use as a shopping place. The old bazaar was never used for living, it always was a shopping area and contact zone of the Christian and the Muslim population as they lived in separate parts of the town. It is a structure of many streets lined with small shops. The crafts were divided between the Christians and the Muslims. All the shops used to be same size no matter if they belonged to a Christian or a Muslim. Each street hosted different craft, and all stores from that craft were on one street,for example gold street, shoes street, pots street, dress street, etc. The stores were closed with wooden shutters which were lowered when the stores were opened and the goods were displayed on them. The old bazaar was surrounded with markets. Hygienic care was taken and different markets were placed on opposite sides of the bazaar. For example the food market was on the opposite side of the bazaar from the animal market; milk, milk products and honey market opposite from the wood market etc. Beside the stores there were other objects in the old bazaar too, like hamams (Turkish baths), hans (hotels), mosques, and some churches. The outside walls were usually were surrounded with stores so no space would be wasted. Even today it is hard to spot some of this object. Bit Pazar. the biggest of the green markets in Skopje. It begins where the bazaar ends and has existed on the same spot for hundreds of years. A walk around can be fun, but you can also get cheap fresh fruits, vegetables, salads, cheese, teas, spices and flowers. Another good green market to visit is the Green Market or Zeleno Pazarce, near the Parliment Building and Bunjakovec Market near the Cathedral. Skopje City Mall. The biggest mall in Skopje. You can find international brands, like Zara, Mango, Springfield, Pull&Bear, Bershka, New Yorker, DM drugstore, and Carrefour supermarket. There is a Cineplexx cinema, and a bowling bar. Ramstore Mall. An American looking mall, with some nice shops, restaurants, cafes and cinema. GTC. the biggest shopping center in the city. It was made in the 1970s by Zivko Popovski. It includes cafes, restaurants, bars, banks, shops,and even has a bowling court. Super VERO Center, Boulevard Kuzman Josifovski - Pitu. Another American-looking mall recently completed and part of the VERO network. Very spacious with a huge supermarket, a few restaurants and cafes, the huge Jumbo shop (Target-like), and all kinds of small shops for clothing, accessories, T-Mobile/T-Home, ONE and VIP salons etc. It has good parking. Biser. A new shopping center with very nice cafes, bar, and shops. It can be found in the Aerodrom municipality of Skopje. Many young people from the city come to spend their extra time here. Shops include mobile phones, electronics, clothes and banks. There is also a supermarket across the street. Bunjakovec. this is one of the malls were everybody can find something to buy. It is in one of the busiest thoroughfares in Skopje. In includes many shops and boutiques. Skopje offers something to satisfy all modern tastes and appetites. Make sure to try the famous Macedonian foods such as burek, Shopska Salata, and others. Skopje’s eateries are plentiful and offer a diverse range of local and international flavours. International cuisine is well represented in Skopje with Chinese, Italian, Indian, Greek, Mexican, Middle Eastern and French restaurants all found within the city centre. In addition, pizza and fast food places abound, as do small bakery cafes selling pastries such as the ubiquitous burek - a flaky filo pie stuffed with meat, cheese or spinach. There are many local bakeries all around the city where many Macedonians have breakfast and snacks. Salty pastries are the dominant offer and they are usually combined with plain yogurt. Popular local chains that you can find at various locations are Bake&Cake and Specijal. Alo Alo Pizza, GTC Shopping Centre, Kej 13 Noemvri. Hand tossed pizza. Fresh out of oven. Destan, main square Makedonija next to the triumphal arch. The BEST kebapcinja in Macedonia, and even wider! Destan has a few restaurants around Skopje. You should order desetka so kromid for the most authentic experience - you will get 10 kebapcinja with fresh, chopped onion. For even better ambiance, go to the Destan restaurant in the heart of the Old Bazaar. Enriko Pizza, Leptokarija Shopping Center. The menu includes the most delicious, Italian specialties, pizzas, pasta, pizza sandwich etc. Makedonska Kuka, City Park nearby Stadium. Picerija KID, Kisela Voda, Sava Kovacevic 47v lokal 11. 8AM-12PM. Hand tossed pizza. Fresh out of oven. Kaj, Old Town One of the first places you come to when wandering from the centre to the old town. Traditional Balkan food. Main course + vegetables + beer + mastika = under 300 MKD/€5. Martini, Boul. Partizanski Odredi, TC Leptokarija sec.5, lok.2 from the centre walk up Boul. Partizanski (3km!) or even better, take the bus. 10AM-1AM. Specialises in waffles, also does pancakes, salads, etc. Waffle + drink = 295 MKD/€5. Restaurant Ekskluziv, Narodni Heroi bb Kisela Voda, near sports hall Rasadnik. a short distance from the centre of the city centre where you can find really tasty traditional food and enjoy in the modern ambience. The restaurant also has a large hall which is perfect for larger gatherings and cocktail parties. Restaurant 14,Taftalidze, near the green market, a few minutes drive away from the centre of the city. Beside the traditional Macedonian food, macrobiotic and vegetarian dishes are available for the guests. Kibo, T.C.C. Paloma Bjanka. Different, mixed salads at your choice, self service. Amigo, ul. Makedonija. Mexican restaurant. Mirko 919, Gavriv Konstantinovic 76,5 km from the centre of Skopje. Range of specialties such barbecue, seafood, game fish. Try the Dojran crap, as well as roast meat, frog legs etc. Harmonija, T.C. Skopjanka no.37. Restaurant for macrobiotic, vegetarian, and dietetic food. Food is prepared without gluten as well as specific seminars for alleviation of particular health problems. Zanzibar Pizza, Str.Atinska no. 21. The only place where you can find pizzas made by the recipes of old Italian chefs spiced with lite jazz motives. Pivnica An, within the Kapan An in the old town. The name is literally translated as "Beerhouse", but this is not a pub! It is one of the few places where you can get a few vegetarian options. Try their delicious "Turli Tava", a rich vegetable casserole. Balkanika, Oktomvriska revolucija 24 across h. Aleksandar Palace. Ethnic food from Turks, Serbs, Albanians, Bulgarians, Vlaches, Greeks, Gypsies, Bosnians. Den I Nok (Day and Night), Str. Skupi bb. Club restaurant. Piano sounds performed by popular music groups. Duomo, Teodosie Gologanov no. 67. From W-Sa, enjoy in live music. Mediterranean, Italian, national, international and seafood. Equestrian, Kuzman J. Pitu no.19, loc.56. Club restaurant. Varied menu, including some Indian dishes. Kamnik, Kamnik b.b. Located in the hotel of the same name, 150 different wines from all over the world. Kej, Kej 13 Noemvri no.34. Intimate and pleasant place by the Vardar river. Marakana, City park. Italian specialties, unique sea fruit and fish. The restaurant also has 2 ballrooms with 150 seats, and it also offers the opportunity for cocktail parties with up to 500 guests. Meana Karpic, Str. Debarca br. 21. Home cuisine, grilled barbecue, grilled fish, cooked vegetables, stews, specialties, music, and wine! Nana, Square Macedonia - Risticeva Palata. Assortment of delicious meals, made from the world finest ingredients, such as caviar, salmon, goose and duck pates, goose liver, proscuitto, tartufo, cheese, fresh vegetables and salads. Offers 40 types of wines in glasses or bottles, including all of the Tikvesh special selection and limited production wines, as well as imported French, Chilean, Spanish, Slovenian white and red wines, foamy wines and champagnes. Okarina, Str. Helsinki no. 58a, nas. Taftalidze,old Cvrga. Macedonian and international specialties. live music. Pantelejmon, v. Gorno Nerezi. Magnificent ambient and view on the city of Skopje from the terrace. Macedonian national cuisine. Try the Pantelejmon pie and sheep yogurt, Pantelejmon pan, Lamb meat in a bowl. Ragusa, Str.12 Udarna Brigada 2a. Ambient, accompanied with pleasant music. Roulette Restaurant & Club, Simeon Kavrakirov no. 9a. Great choice of different meals and quality wines. SushiCo, Aminta III. The only place in town where you can get sushi and other Asian dishes. Tomce Sofka, Jordan Hadji Konstatinov Gjinot 14. Taste national and international specialties and the evenings here are filled with the sound of old city music, which contributes to the intimate ambiance. Tri Biseri, Bul. Jane Sandanski br.7. Its not hard to find good cafes but a good place to start is by the riverside near the old bridge, and at night this becomes a lively party area as well. Cafe Li, Ankarska 23, Taftalidze. Ciao Caffe, GTC Shopping Mall 3/6. Ego, Str. Orce Nikolov no. 20. Intermezzo Caffe, Str. Mit. Teodosij Gologanov 65. Caramelo, Maksim Gorki 25. A Starbucks-like cafe. Small, but with excellent choice of coffee, tea and juice. Coffeeshop Company, Second floor of Soravia Center. Plenty of bars in the Old Bazar, From Macedonia Square, go accross the Stone bridge, and then just keep the straightest line as you can. This area has a plenty of newly open bars, and the night life there recently has become very interesting. Some of the bars there are La Kana, Damar, Rakija Bar, Pivnica, New Orleans, etc. Debar Maalo neighborhood, There are a lot of nice bars in that area, where the hip locals like to hang out. Check out Krug, Bastion, Kala, Kino Karposh, Deus, Jukebox. They are mainly around the streets Aminta III, and Orce Nikolov. Casa Cubana, Kej 13 Noemvri. Excellent atmosphere, and a great place to go dancing. Good selection of cocktails. Be aware that there is a face check at the door. Irski Pab Sv Patrick,Irish Pub St. Patrick, GTC Skopje. Izzi Caffe, Katna Garaza Zebra - Vasil Gjorgov BB, Next to Hotel Queens in the 'Zebra' mall in in the neighborhood Kapistec. Cool place to have a drink, in the morning (coffee) or at night. The owner speaks English and will hang out with you to make sure you're taken care of. Jazz Inn. If you like jazz music. Sometimes there is live music. Penguin Pub, Mito H. Jasmin 50. Daily live music. Try food prepared on volcano stones. Piazza Liberta, Str. Dimitrija Cupovski 24. Eat the peanuts and throw the shells on the floor. Plaza de Toros, Kej 13 Noemvri on the quay of Vardar. Delicious snacks: taco chips with melted cheese, fried chicken wings fresh salads, pizza, warm sandwiches, or some homemade sweats. Offers a large variety of beer on drought. Soul Pub, Str. Maksim Gorki 20. Good music and beer. Club 69, Macedonia Square. One of the best clubs in Skopje. Works only four days a week: Thursday, Friday, Saturday and Sunday. Club Colosseum. It's a place where often worldwide famous DJ's play music. The club is located under the new railway station. Club Kapan An, Old Bazaar. The place for those who like avant-garde electronic music, including dubstep, dnb, and techno. Saloon. A cool place with Western-style decor and rock music. Sector, City park. House and techno. Universe Hostel Skopje, Tome Arsovski No. 40 B, first floor. checkin: 13:00; checkout: 10:30. In a quiet location only a 10-minute walk from the centre of Skopje, Universe Hostel features a garden, a shared living room with cable TV, and free WiFi. Free parking is available on site. Rooms are equipped with lockers and orthopaedic mattresses and overlook the garden. Linen and towels are provided, and bathrooms are shared. A washing machine can be used free of charge after 2 + nights. Hostel Universe features a shared kitchen for self-catering, free coffee and tea are provided there. The 24-hour reception provides tourist information and can arrange various tours and activities in and around Skopje. The nearest grocery shop is within 30 metres, and the closest restaurant is 200 metres away. A bus stop (line 24) is 100 metres away and provides direct connections to the city centre. Skopje’s Bus and Train Stations are a 15-minute walk away, and Skopje Airport is 25 km away. Airport transfers are available on request and at an additional cost. . from 7 - 40 eur. Unity Hostel, Blvd. Ilinden No. 1, first floor. checkin: 14:00; checkout: 12:00. Unity Hostel is situated in the very city central core, just across the government and the river side. Opposite the Kale Fortress, 300m from the main City Square, Old Bazaar, Museum`s quarter, beautiful City Central Park, bars, clubs & restaurants, all accessible on foot, thus saving you the taxi/bus fare, making this hostel the ideal base to enjoy your exploring time. Comfy beds are equipped with eco relax orthopedic mattresses, free bed linen and towels, huge secure in-room lockers, power sockets, shelves, reading lights and bed curtains for privacy. Big common room with cable TV and board games, and fully equipped kitchen open for use 24/7. Breakfast is free of charge, as well as tea & coffee. We also provide free Wi-Fi in every room, free internet/PC access, hot showers 24/7, city map, tour desk, laundry room upon request, beautiful courtyard ideal for relaxation. Free parking in front of the hostel. 9-30 eur. Get Inn Skopje Hostel, Stiv Naumov 102g. checkin: 14:00; checkout: 12:00. Get Inn Skopje Hostel is a brand new hostel located in the center of Skopje. Perfect location, only few minutes walking from the central bus and train station but also few minutes walking to the main square in Skopje. The hostel is located in a building with old architecture, so you can enjoy the authentic look of Skopje. The hostel features 2 private rooms and 3 dorms with total capacity of 22 people. It has common area, balcony, yard, free high speed wifi, fully equipped kitchen, laundry, tv, safety lockers and car parking. The owner of the hostel is a licensed tour guide in Macedonia. Get Inn Hostel is offering free stuff every day like homemade macedonian rakija, macedonian wine, laundry, bike or even haircut. 10-20 eur. Urban Hostel & Apartements, Majka Tereza 22. checkin: 14:00; checkout: 12:00. The biggest hostel in Skopje, situated in the city center, it offers a friendly and affordable accommodation for everyone. The rooms are bright, clean, comfortable, highly affordable and fully equipped. Showers and toilets are found on each floor, two of them equipped with Jacuzzi in the hostel. Apartments are with with private bathrooms. All of the rooms & apartments have WiFi access free of charge. There is a multipurpose room with a big TV set and 120 cable channels, laptop, fireplace, aquarium, piano and a fully fitted kitchen. Rent-a-bike and parking lot are also available free of charge. 13-70 eur. Hi Skopje Hostel, Crniche 15. Hi Skopje Hostel is a new hostel, located 10 minutes walking from the center of Skopje. Near the hostel there are many supermarkets, ATMs,pharmacy, hospital, police station, exchange office, bakery and all city attractions like shopping malls, restaurants, bars and nightclubs are only 10minutes walking from the hostel. 10-20 eur. Shanti Hostel, Rade Jovcevski Korcagin 11. Small and cozy place located in just 3 minutes walking distance from the international bus and train station, and only 5 minutes from the center of Skopje. Near Shanti Hostel there are large super markets, bars, clubs, theatre, a swimming pool, shopping malls, change office and ATM. From €8 - 10. Shanti Hostel 2, Prespanska 11, ☎ +389 2 60 91 807 (hostelshanti2@gmail.com), . Its just behind Shanti Hostel 1. Enjoy your stay. From €8 - 10. Art Hostel Riverside, Ante Hadzimitkov 5. A popular hostel with backpackers, 20 minutes walk from the station, 15 minutes to City Square. Helpful and friendly staff, this hostel has the feel of student accommodation. Dorms and privates, with shared bathrooms. Free internet access, outdoor social area. 10% discount with a flyer which you can get from the hostel itself, or hostels in other cities. Dorms from €7. Skopje Apartments, Frederick Shopin. checkin: 13pm; checkout: 11am. New cozy and nicely decorated apartments near Skopje city center. A true city oasis suitable for business or leisure stays. Comfortable with 2 double beds , fully equipped kitchen and little extras,big walk-in closet in mirrors and free WiFi will make your stay in Macedonia's capital very pleasant from 30eur. ARSS Apartment Skopje Main Square, Macedonia street 22. checkin: 12pm; checkout: 10am. The apartment is located in the very heart of the city, on the square in the center of Skopje. It's location is perfect for tourists, all the attractions can be reach within minutes by walk. The apartment is fully equipped and it can hold up to 5 persons. Air conditioning, wifi internet and private secured parking is free of charge for the guests. from 30eur. Imperial Hotel. This comfortable hotel that offers excellent accommodation is located just 1.5 km from all the shopping malls and the Skopje Square. The Hotel offers free 24 hours wifi/wlan internet and free laundry service. Hotel Kapistec, Mile Pop Jordanov 3 Skopje. Quiet,safe and nice area. Hotel Square, Nicola Vapcaov 2 6.floor. The top floor of a office building. Very nice rooms, friendly staff, and a open air balcony with a excellent view to Square Macedonia and the stone bridge. Rooms with air-con and TV. €45. Holiday Inn Skopje, Vasil Agilarski 2. next to the river, situated at the end of stretch that has all the bars and restaurants which are great in the summer. Urban Hotel Skopje Business Hotel Reinvented. Aleksander Palace, Bul. Oktomvriska Revolucija br.15,5 minute drive from the center. This 5-star hotel is probably the finest and most expensive in all Skopje. Hotel Ambassador, in the center of Skopje in a quiet neighborhood close to the St. Kliment of Ohrid cathederal. Hotel Arka (Hotel Arka), Bitpazarska 90/2 in the Old Bazaar. 5-star hotel. Arka is modern, luxurious and comfortable five star hotel. Its interior is furnished according to newest trends in the modern interior architecture. It is situated in the historic nucleus of the Old Skopje Town. From €88. Hotel Continental, Aleksandar Makedonski adjacent to the Skopje Fair, 5 minutes from downtown Skopje. The largest luxury Hotel located in the city, in a 10000 m2 landscaped garden. Hotel Stone Bridge, Kej Dimitar Vlahov no.1. 5-star hotel. The rooms and suites, many with superb views of the Vardar River, Stone Bridge, Square Macedonia with modern city, Fortress Kale, Old City with Churches and Mosques, are spacious and luxurious, giving an extremely comfortable and elegant feel. Hotel Victoria, Slave Delovski no.18,500 meters from the center of the city. Three star hotel in very pleasant surroundings isolated of the city noise. Restorant, closed parking space which is secured 24h, reception desk, hall for buffet breakfast. Skopje, just like most of the rest of Macedonia, is a relatively safe place. But, the usual rules about common sense apply here as they would anywhere. The places where crime occurs most often are in the places where tourists have little reason to be at. Exercise a level of caution or avoid the old market at night as it becomes desolate, however, the area of the old market near the Stone Bridge where most of the bars are located is safe. Like many other parts of Europe, there are people who will beg around the major tourist sites and sometimes engage in pick-pocketing. The stretch of land along the north side of the river between Blvd Krste Petkov Misirkov and Belasitsa is not a good place to walk alone at night, unless you are looking for something very specific. Marko’s Monastery is an active monastery situated outside Sushica village on Kitka mountain. It was founded by king Volkashin in 1345 and finished by his son King Marko in 1366, who is also the donor of the frescoes painted between 1366 and 1371. It is unknown why the monastery is built in the vicinity of Skopje instead of Prilep the capital of their medieval kingdom. It is presumed that the grave of king Marko (who died in Romania fighting the Turks) is here but it was destroyed by the Turks. The architecture of the church is a cross in square with a central dome and a blind dome in the narthex. The elegant exonarthex (open porch) was added in 1830 by Hamzi Pasha, who was a generous donor of the monastery throughout the 19th century. It is quite surprising a Turkish aristocrat to be a donor of an Christian monument. The frescoes are work of more artists with different skills and are well preserved. Visible is the tendency for adding dramatization and narrative painting of the scenes. Most interesting is the unique scene The cry of Rahela (Mathew 2:18). On the southern facade the portraits of king Volkashin and king Marko are painted. There is a bus going to the village but just few times per day. From the village there is half hour walk to the monastery. Behind it there is a river and a small picnic area. While in the area also visit St.Bogorodica church also referred as St.Nikola church in Sushica village, built in the 13th century. Sushica is 36 km from Skopje. Skopska Crna Gora and its medieval churches and monasteries – even though Vodno is the most popular hiking option in Skopje, a fun and educational day trip from Skopje is visiting the villages, churches and monasteries on Skopska Crna Gora Mountain. Easiest way to do it is with a car, but also one can take a bus to one of the villages like Banjani or Kuceviste, and hike to the surrounding points of interest. St.Nikita monastery in Banjani village was built in by Serbian king Milutin in 1307-08 on a site of an earlier church. It is a single domed church of a written cross architectonical solution. The frescoes are work of the famous Ohrid painters Mihailo and Eftihie. Unfortunately they lack the energy and the technique of Bogorodica Perivlepta church in Ohrid. It is quite probable that by now they had a big group of students around them and they just controlled the work. If one looks carefully one can see where them two picked up the brush and corrected the work. Most significant fresco is the Pursuit of the Merchants from the temple where one can see the human elements characteristic for their work. Banjane is 16 km from Skopje. St.Bogorodica Church in Kucevishte village the naos was built closely before 1348. The narthex was built somewhere between 1355 and 1358 by local aristocrat Radoslav and his wife Vladislava. Above the nathex there is a grave chapel for Radoslav and Vladislava. The painter of the frescoes of the naos is quite good, educated, well acquainted with the work of Mihailo and Eftihie, quite probable their student. Still his work doesn’t reach their energy, colors and elegance, but he is quite good in composition and placing figures in it. Like his teachers he did sign his name on the northern column by the icon screen, his name is Grigorie. The frescoes of the narthex have been damaged by fire and the grave chapel was painted by a less skilled painter. Holy Archangels Michael and Gabriel Monastery in Kucevishte village was built towards the end of the 14th or maybe the beginning of the 15th century. The church is threeconhos with a dome, and elaborate ceramic decorations on the facades. There are two inscriptions dating the frescoes from 1631 and 1701. The figures are presented small in size, poor in colors but with bold drawing with an attempt to present landscape. Most famous is the large presentation Tree of Jesse. St. Nikola church in Ljuboten village was built in 1337 by Mrs. Danica a local aristocrat whose sons had important positions,something like mayors or governors of strategic positions on the entrance of the city. She built the church in honor of her passed husband. It is a single domed church of a written cross architectonical solution. Parts of the frescoes are in bad condition. Influenced by the works of Mihailo and Eftihie. The Serbian royal family is presented king Dushan, queen Elena and prince Urosh, it is interesting that the painting treatment of them, especially the colors are different than those for the saints. Kucevishte is 14 km from Skopje. Tumba - an archaeological site from the Early Stone Age. Ceramic models of houses formed in the shape of the female body are among its valuable finds. Cerje - an archaeological site from the Early Stone Age. Its unique finds include the figurine known as Adam from Govrlevo, one of the earliest prehistoric male figurines. Gradishte - a fortified settlement from the Early Byzantine period. It is believed to be Taoresion, the native town of Emperor Justinian. Marko's Castle - An Early Byzantine fortress, heavily fortified with 40 towers. It was the site of the medival town of Crnce. Matka - A gorge in which a rich complex of medival monasteries and remnants of a fortress remain. Skupi - the ancient city of Skupi is almost not worth the effort to reach. There is almost nothing left except for part of a street, a bath, and a basilica. After the city was ruined by the earthquake of 518, all the building material was used in the building of Justinijana Prima,one can see almost all of the seats of the Roman theatre incorporated in Kale Fortress. It is interesting that even though the earthquake was very strong and completely ruined Skupi there were almost no casualties. The inhabitants fled the city just two days before fearing from Avar attacks and settled in the small fortresses they had built on Vodno and in Matka. Vodno Mountain - 1066 meters above sea level it towers over Skopje. It is popular hiking place with marked paths leading through the woods and there are a couple of rest areas. On the top of Vodno the Millennium Cross was built to mark 2000 years of Christianity in Macedonia. It is 66 meters high and it is the highest structure in Macedonia. Tetovo Around 50 km (50min by bus, plenty of busses around every 30 min weekdays and every hour at sundays). Nice Painted Mosque, Tekke Arabati-Baba and nearby skiing in popova shapka.